Writing a book is hard. Still, I’d rather write a 5-novel series than a book blurb. And when it comes to writing a couple of paragraphs about me, aka Author Bio, well, that’s when I really freak out! Why is it so darn hard telling the world a few things about us? So, I was particularly happy when I discovered this excellent post on writing your About Me page. It comes from a surprising source–Elegant Themes, the makers of my favorite WordPress theme, Divi. Read on for some great tips on creating a killer Author Bio page, courtesy of Lindsay Pietroluongo! I am a featured guest at Richard Dockett‘s The Indie Showcase. Please come by to visit. Today The Showcase features a poet which is a first for the site, please welcome Miriam Hurdle. Thank you, Richard for featuring me on your website today. I grew up in Hong Kong where I spent my childhood, college and early career years. My dad made a great impact on me for my love of reading. He read every single day until he had a stroke at eighty-four years old. When I was at the fourth-grade, I read my dad’s newspaper. We traded sections to read. I read the horrible news describing the details of crime scenes, read adult fantasy, comic strips and the Sunday children’s section. In elementary school, my favorite literature was Aesop’s Fables. I read each story with the anticipation of learning the moral of the story. This literature has influenced my attitude toward life, my thinking and writing. I wrote a diary as a teenager. The lessons in Aesop’s Fables weaved into the diary and I wrote what I thought of the events more so than what happened. As far as writing skills, I remember in the upper grades of elementary school, we learned how to write a story with an opening, middle, climax and ending. After college, I worked as a Director of Children’s Department in a literature company. My job was writing children’s magazine. I worked closely with the illustrators in the Art Department. In fact, I recruited my artist. When I taught Chinese as a Second Language at the Baptist University of Hong Kong, he worked there also and sometimes wrote me notes at the end of the day, signed it and drew a little cartoon next to his signature. I liked his art so when I changed job, I remembered him. The comic strips I read in my early years helped me to communicate with the artists how I wanted to illustrate the stories in the magazine. The experience I had on this job also helped me to layout and illustrate my first poetry book forty years later. Creativity is the use of imagination or original ideas to create something new or somehow valuable – inventiveness. The created item may be an idea, a scientific theory, or even a joke; or a physical object, maybe a new invention, a literary work – or a painting. – Anne Christine. I shared my watercolor painting before. 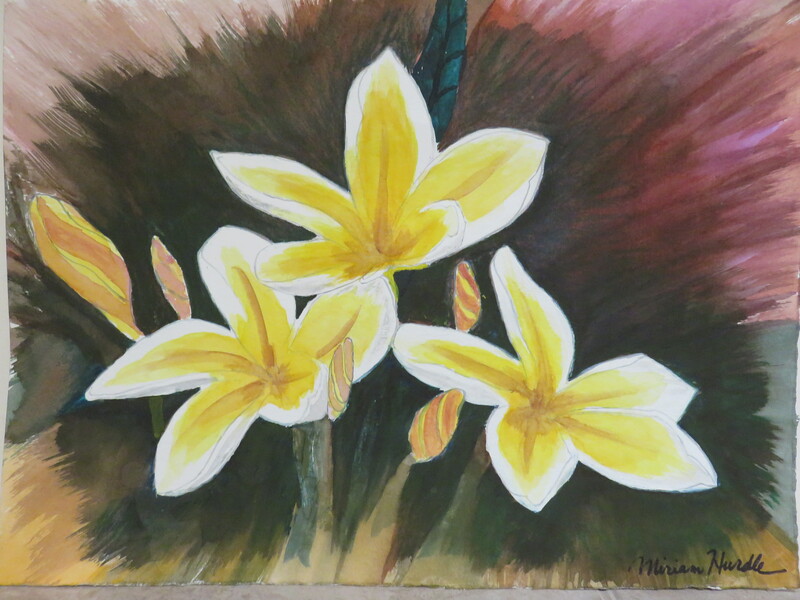 Today I want to share my other hobby – ceramic painting. My first ceramic piece was a free-handed project made with clay. I took a ceramic painting class as part of the Child Development program at California State University, Los Angeles. The students were to create any projects from a block of clay, then painted and glazed them. The professor then put them in the 1,800 degrees Fahrenheit kilt to fire them. I was pregnant with my daughter at the time and wanted to make something for my daughter. The idea of a nightlight came to my mind. Making a whale with holes from the blowhole, eyes and mouth gradually materialized. A light bulb holder is at the bottom to hold the light shining through the holes. I used both slab and coil building methods. The slab method was to use a rolling pin to make the even thickness of the bottom of the whale. I then used the coil building method to build the wall of the whale. When my daughter was nine years old, she and I took a ceramic painting workshop in the summer. At the workshop, we worked with greenware shaped by molds. It is bone dry but is fragile and breakable. The two pieces my daughter worked on were a girl with a unicorn and a bench. My two pieces were two dolphins and a basket vase. We used sponge and water to clean the objects, then use the tools to make any designs. We then apply the under glaze of any colors of our choosing. After the first firing, we applied the clear glaze for the second firing. My daughter and I keep this hobby and worked on some projects separately. I worked on several bisque pieces. Since they are cleaned and fired once, all I needed to do was to apply the colored glaze and the top layer of clear glaze for the second firing. I have collections of angels and fairies. Here are the three of the fairies I painted. On several occasions, my daughter and I went on night outs to do painting together. The following photos were from the time I did one piece for my husband. Sally is having a Easter Parade part 2 today and I joined the fun. The Sunrise Service was 6:15 a.m. this morning. I didn’t go. Last night I had my clothes ready so I could just have a cup of coffee before hitting out the door. I got up at 6:00 a.m. and made it to the call time for the choir at 6:45 a.m. We sang for three Sunday Services – 8:30 a.m., 10:00 a.m. and 11:30 a.m.
Our church fellowship has an annual auction fundraising event for the missionaries. There are open auction and the silent auction. Members of the group donate goods or activities for auction. We then bid on the items and all proceeds go to the missionaries. My husband and I donated a steak dinner event, and the bid went up to $400 from two couples. A friend and I sponsored a silent auction of brunch for 12 ladies with $25 each. There were more ladies who wanted to sign up, but it quickly filled all the spots. We signed up for five silent auction events and bid for two open auctions. One of the silent auction I got was a Spring Brunch held last Saturday. The hostess decorated her home with Paris theme. The co-hostesses did a fabulous job to make the event memorable. The food was delicious and beautiful. Being with this almost 30 years of long-time friends is always a delight and enjoyable. Photos from tonight’s Good Friday Service.